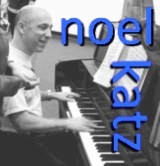 Noel Katz writes musical comedies: Most famously, his wedding was a musical, got full page coverage in The New York Times, Dramatics and Theatermania. The original cast recording is a collector’s item. Murder at the Savoy (or, Pulley of the Yard) sold out at the 50th Edinburgh Festival, got five stars from The Scotsman, and has been produced five times in Great Britain. His first produced musical was also in Great Britain, Through the Wardrobe. His musical about the early days of live television, Such Good Friends, was the hit of the 2007 New York Musical Theater Festival, winning awards for lyrics, direction, lead performance, and best musical of the season. In between, he wrote Spilt Milk, Popsicle Palace, Area 51, The Christmas Bride, On the Brink, The Pirate Captains, The New U. and The Heavenly Theatre and others. His most recent creation is a two-character musical about how a marriage survives parenthood, The Music Playing. Excellent site. So nice to reach out and touch someone who is doing what I do only in better places. Thank you for all the work.